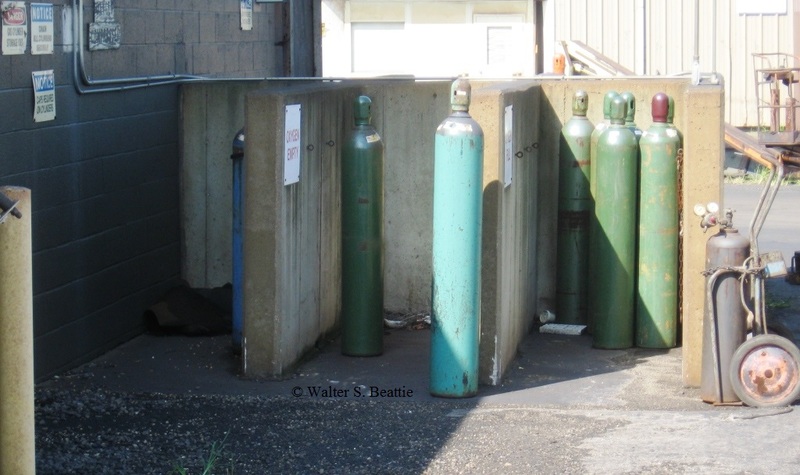 I run across a lot of improperly secured pressurized compressed gas cylinders. 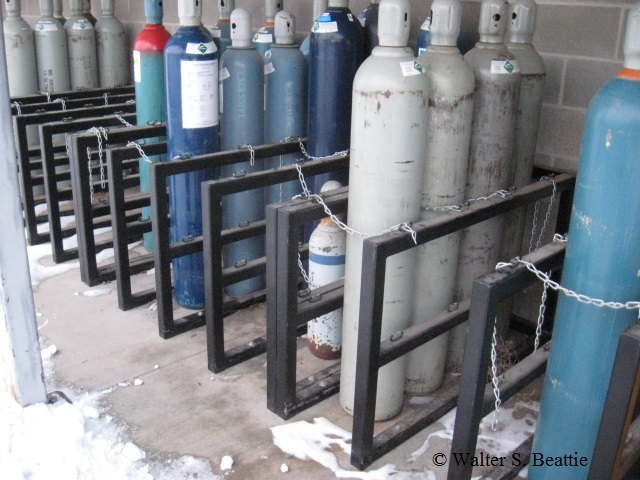 There are correct and incorrect ways to maintain and store compressed gas cylinders. Although chains and eyelet rings are provided, they are not being used. bottles are not secure. They are in direct sunlight. Although chains and eyelet rings are provided, they are not being used. bottles are not secure. They are stored in direct sunlight. There are three main types of gas cylinders. Liquefied gases are gases that become liquids when they are pressurized. They exist in a liquid-vapor state within the cylinders. Examples are anhydrous ammonia, propane, chlorine, nitrous oxide and carbon dioxide. Non-liquefied gases are gases which remain in the gaseous state when pressurized. Examples are oxygen, nitrogen, helium, and argon. Dissolved gases are gases which are dissolved into another material. Acetylene is the most common gas and it is dissolved in acetone. Acetylene is very unstable and can explode under pressure. It is commonly used and people may become complacent in its use. Pressure cylinders have an incredible amount of stored energy. Cylinders may have over 2,000 psig of pressure. Even empty, a cylinder may have over 100 psi of pressure, more than the pressure in your automobile tires. A regulator or other assembly is placed on the cylinder head before opening the valve. This safely controls the pressure release. The cylinder should not be opened without a proper assembly to control the pressure. Opening a cylinder will allow full pressure of the cylinder to escape. Uncontrolled pressure may pierce the skin, break an eardrum, or damage the eyes. Uncontrolled release of pressure from accidentally breaking off the head can be extremely damaging. The cylinder may fly like a rocket with enough power to blast through concrete block walls. uncontrolled pressure releases may allow the cylinder to fly may hundreds of yards, even after blasting through walls. the cylinder may ricochet around inside an enclosure or spin uncontrolled, causing significant damage. Many of the gases used in industry are flammable or support combustion, such as oxygen. Some are asphyxiates, others are poisons. Each cylinder should be properly identified as to its contents. Most are color coded. Do not paint bottles a different color. Many cylinders have a special or left hand thread to prevent improper hoses from being attached. Some gases are reactive with other materials. For instance, do not allow grease to contaminate oxygen cylinders. 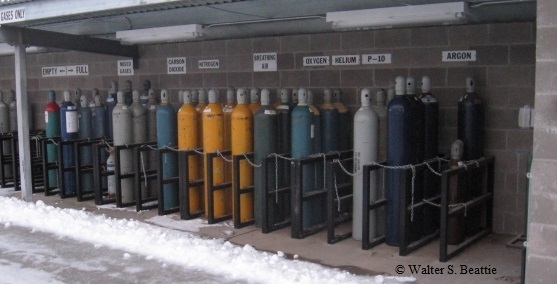 Provide proper signage for compressed gas cylinders at the storage area and point of use. Cylinders should be stored in accordance with all local, state, municipal, and federal regulations. 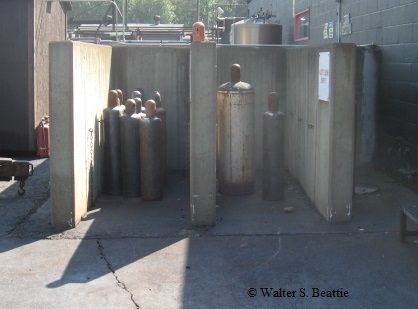 Cylinder storage areas should be provided with signage to identify the products being stored. Gases of different types should be grouped by type. incompatible gases must be separated from one another. Proper signage should be provided. Charged and empty cylinders should be stored separately. The layout of the operation should be such that empty cylinders may be removed easily with a minimum of handling. The area should be open to allow for dollies and handling equipment to be used in an unobstructed manner. Storage rooms should be controlled environmentally. They should be dry, cool and have adequate ventilation. Substantial, noncombustible, and fire rated construction should be used. Cylinders should be stored at grade or above, not in depressions such as basements or on ledges when they could fall and become damaged. Heavier than air gases will lay in the low levels and accumulate. The storage area should be away from heat producing equipment, out of the direct sunlight from the warming sun, and ideally below 125°F. The storage area should be away from highly flammable and combustible materials such as oils, fuels, and waste materials. The area should be secure and protected from damage and vandalism. Cylinders should be protected from corrosion. Corrosion may be from excess water, acids, salt, chemicals, or chemical fumes such as from industrial processes. When in use, the regulator should be attached and in a protected area. Cylinders should be stored in an upright position. They should be stored with their protective caps screwed in place and be individually secured. Cylinders should be chained individually. The chain should be above the tip point of the cylinder, about 2/3 of the way up the bottle. I recommend heavy metal chain for securing bottles. In the event of a fire, polyester, nylon, and fabric straps will fail much earlier into a fire. Even if you have gotten out of the building by that time, your emergency response team and firefighters are subject to injury from a falling bottle. I see web strapping in laboratories, and discuss the security of fabric under fire conditions. in Construction sites, I see a group of cylinders with a rope around them – an unsafe condition and an inappropriate method of storing pressure cylinders. Oxidizers and flammable gases should be stored in separate areas, separated by concrete walls or adequate separation (at least 20 feet). NEVER PLACE ACETYLENE CYLINDERS ON THEIR SIDE. Cylinders are protected from the sun and weather by a canopy. Individual slots are provided for cylinders and a chain is used for securing each cylinder. Cylinders are protected from the sun and weather by a canopy. Individual slots are provided for cylinders and a chain is used for securing each cylinder. Even short cylinders are provided with caps and chains. Speaking of laboratories, it is many times safer to provide a dedicated properly designed, ventilated cabinet outside of the lab and piping to the work station. Changing bottles is easier, cylinders do not need to be moved within the lab, and they are out of the way and less subject to damage. Flame impingement onto a tank is extremely dangerous as it heats the gas, increases the pressure, and weakens the cylinder shell. Also, remember that steel cylinders will conduct electricity. They may become part of an electrical circuit if allowed. Empty cylinders should have the regulators removed and the cap should be screwed onto the top. Empty cylinders should be stored separately from full cylinders. Mark the cylinder as empty or place a distinguishing tag on it. Unless proper provisions and training are provided bottles should be refilled only by the supplier. Never release the gas totally. At least 25 psi of gas should remain in the cylinder to prevent air from entering the cylinder and potentially contaminating the next refill. Totally emptying the cylinder will require the distributor to go to extra expense to purge the cylinder, then refill it. Treat every cylinder as though it is under full pressure. Discounting the hazards because a cylinder is almost empty is a dangerous practice. When moving cylinders, special carriers or dollies should be used. The carrier should secure the cylinder and prevent it from rolling off. Regulators should be removed and caps replaced. Employee training should be provided for all employees using or working in the proximity of pressure cylinders. Emergency response plans should be developed, implemented, and updated at least annually. – OSHA Standard Number 1910.101, Compressed gases (general requirements). – OSHA Standard1926.350(a), construction standard for storing compressed gas cylinders (for welding). – OSHA Subpart Q, Welding, Cutting, and Brazing, Standard 1910.253, Oxygen-fuel gas welding and cutting. – OSHA Subpart H, Hazardous Materials, Standard 1910.102, Acetylene. – NFPA 55, Compressed Gases and Cryogenic Fluids Code. Chapter 2 has a list of other referenced publications which may also provide good information. This entry was posted on Saturday, March 16th, 2013 at 2:31 pm and is filed under Uncategorized. You can follow any responses to this entry through the RSS 2.0 feed. You can leave a response, or trackback from your own site.